West Riding of Yorkshire: Adlingfleet, Airmyn, East and West Cowick, Eastoft, Fockerby, Goole (2), Gowdall, Haldenby, Hook, Ousefleet, Pollington, Rawcliffe (2), Reedness, Snaith, Swinefleet, Whitgift. County of Lincoln: Gowthorpe or Garthorpe, Luddington. The population falling within the union at the 1831 census had been 10,531 with parishes and townships ranging in size from Fockerby (population 103) to Goole itself (1,671). The average annual poor-rate expenditure for the period 1835-7 had been £4,232 or 8s.0d. per head of the population. Goole Union workhouse was erected in 1839 on a site at the north side of Murham Lane (now Boothferry Road) at the north-east of Goole. It was designed by John and William Atkinson who were also the architects of many other Yorkshire workhouses including those at Bedale, Beverley, Easingwold, Guisborough, Helmsley, Howden, Kirkby Moorside, Pateley Bridge, Pocklington, Skirlaugh, Wetherby and York. Their design for Goole was a relatively uncommon layout with the various inmates' quarters arranged around a small central courtyard, as opposed to the radial or parallel block plans upon which most designs were then based. As well as the main accommodation block, a small square block lay to the rear at each side as shown on the 1853 map below. On the ground floor of the main block were the Guardians' board room, a waiting room, dining hall, kitchens, food stores, clothing store, sewing room, Master's sitting room, chapel, inmates' dayrooms and washrooms. On the first floor were two bedrooms and a bathroom for the Master, inmates' dormitories, staff rooms, linen room, and store room. Single-storey receiving wards for new admissions were located in the eastern wing of the main block. By 1890, the site had expanded considerably northwards, with additions to the buildings including an infirmary, fever hospital, laundry and mortuary at the north, a nurses' home at the north-west, and a casual ward at the east. The male casual wards consisted of a 5-bed association ward and 10 cells, bathroom, dining room, and tramp major's room. The beds took the form of hammocks. For women casuals, the accommodation comprised three cells, a dayroom, and a bathroom, with bedsteads rather than hammocks being provided. Goole main block from the south-east. From 1904, to protect them from disadvantage in later life, the birth certificates for those born in the workhouse gave its address just as 65 Boothferry Road, Goole. In 1930, control of the establishment passed to the West Riding County Council. At that date it had accommodation for 262 inmates, including 60 "casuals" or vagrants. A 1930 plan of the site (below) shows how each building was then being used. The fever block had become the hospital block, and the original infirmary was now being used for infirm inmates. After 1930, Goole workhouse became Goole Poor Law Institution and later St John's Hospital. 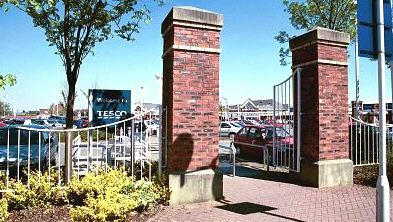 The buildings have now been demolished and the site is now occupied by a supermarket. Goole former workhouse site from the south-east, 2001. The Goole Union operated a children's home at Riverside House, Riverside, Rawcliffe. In 1924, the home could accommodate 34 children, with Miss Rhoda Dyke as its Superintendent. The property no longer exists. East Riding of Yorkshire Archives and Local Studies, The Treasure House, Champney Road, Beverley HU17 9BA . The few surviving records include: Guardians' minutes (1837-1930); Assessment committee minutes (1862-1872); Letter book (1844-1855).